You can trust Purple Crane with any residential or commercial landscaping project requiring a lift. Our family-owned company has been providing prompt, affordable, full-service crane rentals for landscaping projects since 1983. We can handle any lift, whether light or heavy duty: our state of the art cranes range from 3-ton to 75-ton capacity, and our 75-ton crane can extend to 165 feet. At Purple Crane, our team of experts works together to get the job done right the first time, every time. Our qualified staff know how to choose the perfect crane for your job, saving you time and money, and our experienced operators are licensed and CCO-certified. Over the years, we've performed tens of thousands of lifting jobs, including a full range of landscaping projects. Our crane services are frequently use to assist in landscaping projects, including tree planting, trimming, and removal. We can lift trees for planting at parks, golf courses, country clubs, hotels, residential properties, and more. We also lift and remove trees for landscaping and construction projects, for cleanup after storms, and for homeowners whose trees are diseased or otherwise pose a threat on their property. From a few pine or palm trees to an entire grove of large trees, we have the capacity to handle any tree removal or transplant job. Our landscaping crane services can also serve other lifting needs: we can safely and efficiently move rocks, statues, fountains, and more. Our cranes can even lift large items over a house or building. If you need to remove, transport, and replace heavy objects, we can handle any job up to 15,000 pounds. 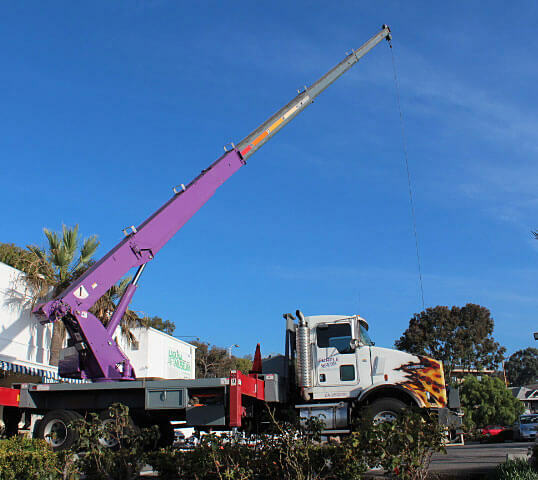 We can transport your trees and other landscaping objects to their new location, and we'll have one of our cranes waiting at the new site to perform any lifting needed when the items arrive. For trimming projects, we can attach a man-basket to one of our boom trucks or hydraulic trucks in order to accommodate the height of any tree. You can rely on Purple Crane for any landscaping removal or installation need. We offer very competitive rates, and our cranes are available anytime. We offer prompt response for emergency situations, and you'll always reach a live person when you call: we're standing by 24/7 to assist you. Call Purple Crane today to find out more. We're OSHA compliant and fully insured, and we can get same-day certificates of insurance when necessary.